Soon, tossing someone a set of car keys may be impossible. Signal-emitting fobs and engine start buttons have already made the traditional key obsolete, and now Hyundai has an idea that could make those amorphous plastic fobs unnecessary, too. The Hyundai Connectivity Concept uses a smartphone to unlock a car’s door. Hyundai unveiled this new tech on an i30 (think European-market Elantra Touring) at its European headquarters in Frankfurt, Germany. All drivers need to do is swipe their phones over a tag, and the door will open. Placing the phone in the i30’s center console syncs it with the car’s infotainment system, streaming music, accessing the user’s phonebook, and setting personal preferences like radio presets. While all of that is happening, the phone is wirelessly charged. It all works through Near Field Communication, or NFC. This form of short range electronic transmission is used for public transportation ticketing (see New York’s Metro Card and London’s Oyster Card). 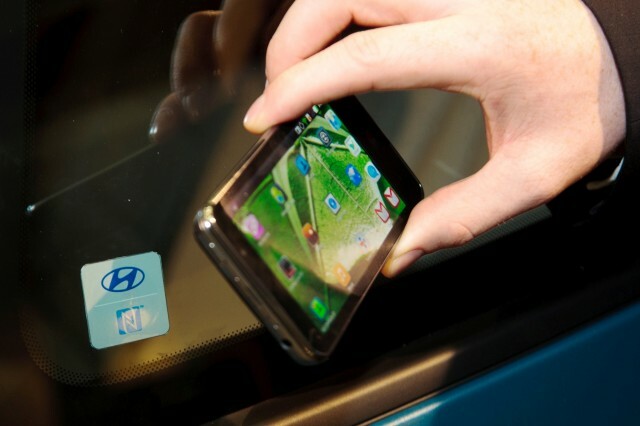 All Hyundai had to do was place an NFC tag on the car, and make sure its testers had NFC-enabled phones. General Motors’ OnStar also allows drivers to unlock their cars with phones, but the Hyundai Connectivity Concept is more streamlined. OnStar works through an app, and commands have to transmitted from the phone to OnStar, and then back to the car. The completely wireless infotainment interface developed for the Connectivity Concept would also be a major step forward in efficiency. Of course, no technology is perfect. Unless Hyundai installs a redundant unlocking mechanism, drivers will have to keep their phones charged to avoid being locked out of their cars. If Hyundai has its way, we’ll be able to see if a smartphone is a viable alternative to a key very soon. The Korean carmaker wants to put its NFC-based tech into production, possibly as soon as the 2015 model year.